Are Food Sensitivities Giving You Acne? One of the most annoying, utterly maddening facets of studying nutrition is when you learn about food sensitivities and how they can affect the body. I hate them. With a passion I cannot explain. What’s worse is the more you delve into them, the more complex they get. But you know what? Food sensitivities are definitely something you should know about especially if you suffer from acne. What are Food Sensitivities and Are They Giving you Acne? Simply put, food sensitivities are kind of like allergies in the sense that your body is attacking a foreign pathogen or some other threat. The main difference is that your body is reacting to the food you’ve eaten just like an allergy to mold, dust, pollen, grass, or pet dander. Allergies typically happen right away after coming in contact with whatever it is you’re allergic to and can be quite mild to severe in nature (think peanut allergy!). This is not to be confused with a food intolerance. Food intolerance definition – less severe symptoms that are usually limited to digestive problems. Food sensitivities are a bit more subtle. So subtle in fact, you might not even notice them. That doesn’t mean they’re not wreaking havoc on your system though. Sometimes these symptoms happen right after eating, others may take several hours or even a day or two. 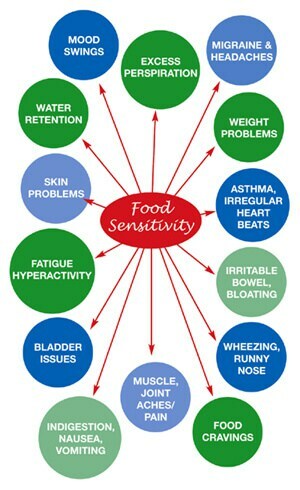 This delay in symptoms is what makes pinning down food sensitivities on your own so difficult. They can be irritatingly hard to trace unless you take very careful notes in a daily food journal. And you know what? Sometimes these sensitivities will only occur when you have combined certain food groups together! So even if you’re okay eating eggs one day and toast on another, combining the two in one meal might be the issue. Crazy right? Before we delve into how to avoid food sensitivities, we need to know how they happen in the first place, which can be a little overwhelming but bear with me here. The production, manufacture, distribution, and sale of almost everything we eat is all part of a staggeringly large industry. Food is picked, slaughtered, packaged and sent around the globe where it lands on the shelves for the general public to purchase. Have you ever wondered what physical state those produce items were in when picked? I bet they were green, unripe, and packed in a crate where they slowly ripened in the dark instead of in the sun. Or maybe the cow where you purchased your beef yesterday was unhappy and full of fear, antibiotics, and artificial hormones before being slaughtered for meat. Or maybe your food was grown in a lab in order to prevent disease, make the harvest bigger, or even produced in crops that grow year round instead of seasonally. These are called Genetically Modified Organisms (or GMOs). These types of things alter our food, and not always in a good way. Their chemical make-up is different from years ago and they aren’t as recognizable by the body as they used to be when our grandparents grew them. These modified types of foods are harmful at best because they are filled with chemicals, hormones, and preservatives. Definitely NOT what your great-grandmother used to eat. Many preservatives are used to improve shelf life, freshness, flavor, and the cosmetic appeal of food. They are used for coloring, bleaching, thickening, and emulsifying so that food products look nice or have the desired “mouth feel”. However, these chemicals are poisonous to the body and consistently eating foods that contain high amounts of these additives and preservatives (processed foods in particular) will increase food sensitivities and in turn make your acne worse too! Food coloring found in many shelf items actually alter your brain chemistry and can encourage debilitating illnesses. Having an autoimmune disease in the digestive tract, a parasite, or an overgrowth of harmful bacteria can put your body into overdrive as it tries to eradicate the threat. It can be very draining and stressful for the body when its immune system is in constant overdrive. Over time, the immune system weakens because of poor diet. Some people may develop Leaky Gut Syndrome from eating too much processed food; an illness that allows microscopic particles of food to enter the bloodstream, creating the aforementioned food sensitivity symptoms and inflammation. The constant state of inflammation wears us down leading to skin issues like acne, eczema, and psoriasis. It can even cause illness and disease. It might sound silly, but eating with reverence will greatly improve digestion and overall well-being. Too often are we rushed into eating during our short work breaks, running from one place to another, or between classes. Our lives are just too rushed in general and our moods dictate how our body will react to food. We are always running out the door with a smoothie or a piece of toast in our mouth instead of a meal that’s slowly savored and enjoyed. While eating with reverence isn’t in itself going to correct food sensitivities, it will certainly lower stress, improve digestion, and just make you feel a bit happier! This will reduce blemishes! Though it’s not the most enjoyable solution, practicing an elimination diet will help you sort out which foods are giving you reactions. This process can be a bit arduous since it has to be done very carefully in order to produce good results. The stricter you are while on the elimination diet, the better you can identify your food sensitivities. Eat this way for at least a month, to begin with. Really try your best! Believe me, it will be worth it! If you follow these simple guidelines and feel measurably better, chances are you’ve eliminated a food sensitivity. At this point, you can add in one food like raw milk, eggs, or one type of grain if you reeeaaallly want to (though you might just feel too good to risk it) to see if you react to it. If you do, then BINGO, it’s most likely a sensitivity. If that’s the case, avoid that food completely (at least several months) before trying it again. One useful method to incorporate when you begin to reintroduce foods is keeping a food diary and closely documenting how you feel after eating certain foods. Doing this will really help you figure out if that food is okay for you to eat or best avoided. Another thing you can do which will take out all the guesswork is to get a food sensitivity test done. I recently had a hair analysis conducted that tested me against 300 non-food items and 300 food items. The results were shocking! I couldn’t believe I was sensitive to so many things. Another great test to consider is the food sensitivity test by Everlywell. As you can see, this is a pretty extensive list! But now I know which foods I need to avoid for the next few months to see if I can reverse my allergies. Your body CAN overcome sensitivities by itself, but you have to heal and support your gut first by avoiding your trigger foods. Just by changing what and how you eat will improve your health by leaps and bounds, including your skin! I know that when I avoid corn, soy, gluten (wheat sensitivity), and dairy I feel waaaay better and my skin is clearer and more radiant. It’s really worth the effort to see if food sensitivities are giving you acne =) Also, to make things a bit easier, you can do a simple food sensitivity test at home here. Do you have any food sensitivities? Please share them in the comments below!